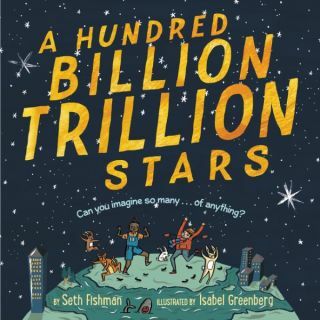 "A Hundred Billion Trillion Stars" (Greenwillow Books, 2017) by Seth Fishman and illustrated by Isabel Greenberg. Carl Sagan was only partly right. For while it's true that we're made of star stuff, it would perhaps be more accurate to say that the universe is composed of numbers. And not just any numbers, mind you, but enormous numbers. Gigantic, mind-bogglingly tremendous whoppers of numbers. Numbers that the human mind can scarcely comprehend. In "A Hundred Billion Trillion Stars" (Greenwillow Books, 2017), a new picture book illustrated by Isabel Greenberg released today (Oct. 3), author Seth Fishman lobs the reader the biggest number of all: the quantity of stars in the night sky. That would be — maybe, possibly, probably — 100,000,000,000,000,000,000,000, including the sun Earth orbits, according to Fishman. "It's a fear of mine that I'll go into a reading and someone will say, 'These numbers are all wrong,'" Fishman told Space.com. "These numbers are all accurate to the very best of my abilities. I know that over time, some things will change." And accuracy isn't the point, Fishman said. As he notes in the afterward of the book, there's a reason why he didn't title the book "One Hundred Nineteen Sextillion Fifty-Seven Quintillion Seven Hundred Thirty-Seven Quadrillion One Hundred Eighty-Three Trillion Four Hundred Sixty-Two Billion Three Hundred Seven Million Four Hundred Ninety-One Thousand Six Hundred Nine Stars." Again, the precise total isn't what matters. What does matter is getting a handle on just how large these numbers are, and how they compare to the other numbers that permeate everything around us. "I think what we're trying to do is make these large numbers accessible to kids," Fishman said. To do so, Fishman doesn't just rattle off unfathomable figures like the number of seconds in a year (31,536,000), the distance between the Earth and the moon (240,000 miles), or how many people go shoulder to shoulder every day on our big blue marble (7,500,000,000), but he frames them in a way that provides perspective. Who knew, for instance, that those 7,500,000,000 humans weigh about the same as the aforementioned 10,000,000,000,000,000 ants? Or that it'd take 420,000,000 kids (or "dogs or smallish snakes or baseball bats") lined up head to foot to encircle the globe? Or that — fun fact! — we might eat up to 70 lbs. of bugs, ants included, in our lifetimes? "A child isn't necessarily going to get the number of raindrops in a thunderstorm (1,620, 000,000,000,000)," Fishman said, "but maybe it'll help them connect with what the word 'trillion' means because they know what a thunderstorm looks like." In case these infinitesimal statistics begin to stir up feelings of existential panic among the 4-to-8 set, which is the book's intended age range, Fishman ends on a comforting, reality-tethering note, one that was inspired by his young son: "There's only one of you. Right here, right now, reading this book." Wrapping up "right there, with the reader" was Fishman's plan from the beginning. "I want [my son] to know that he's an important part of this universe, because I think every kid is, every thing is," Fishman said. "We're all grappling with what it means to be an individual. It was really important to make this not just a book about cool, big numbers, but an invitation to find your spot in that world." Because somewhere among those hundred billion trillion stars, there you are.